This document provides some examples on what kind of colour-magnitude and colour-colour diagrams you should get if you are using the pipeline catalogues in the correct way. Improper use of the catalogues has caused many 'false alarms' during the SV phase. We hope that the examples presented in this document will help the users of the UKIDSS public survey to get the best from this high quality processed data. Only frames passing sensible quality control criteria were used, ie. seeing < 1.0 arcsec, average ellipticity < 0.2, reasonably photometric night from visual inspection of the nightly photometry. The object catalogues were matched detector by detector using a 2.5 arcsec search radius with an iterative 6 constant linear solution applied to matched objects to improve the differential astrometry. Typical differential astrometry averages much better than 100mas for the whole region. Objects matching within 1.0 arcsec were considered reliable matches, ie. the probability of a spurious mismatch is low even in such crowded regions. Objects matching in the range 1.0 - 2.5 arcsec were flagged as unreliable using the classification index. The colour magnitude diagrams were constructed from all objects classified as stellar (ie. cls = -1 or -2 in all bands). In addition, for the colour-colour diagrams, objects were only plotted if their estimated magnitude errors were < 0.1 mag in each passband. For tiles and larger areas a unique object catalog was constructed by searching for duplicate entries within 1 arcsec and retaining the entry with the lowest magnitude error. The example photometry diagrams come from data taken in June 2005 and come from one detector covering the region illustrated in the colour picture at the beginning of the document (just click on it to see it full-size). Note in particular the huge variation in redenning across even this small region (14' x 14'). 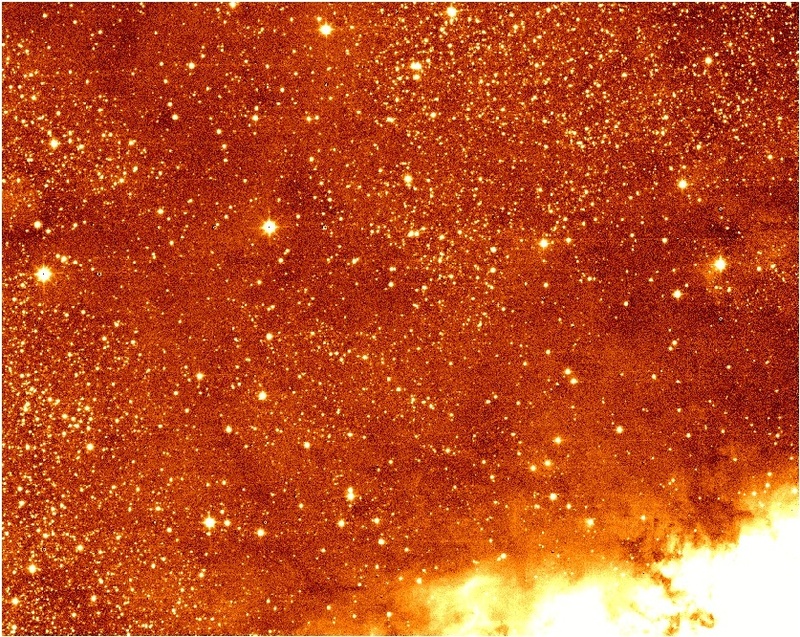 This example comes from catalogues from several tiles taken during April 2005 which when combined cover a total of 3 sq degrees centred on IC4665. These examples comes from LAS catalogues in Y,J,H,K from 4 separate pawprints from SV data taken on 8th April 2005. These were combined to form a tile covering 0.7 sq degrees on sky. Stellar-classified sources are shown as black dots, non-stellar as red.